When Mark Edens wrote the pilot script for me for X-MEN:TAS, there was an X-Man in it that never ended up apprearing on screen as an X-Man. It was the Native American John Proudstar, known as Thunderbird. When the X-Men books were re-started in 1975 (after their suspension in 1970), Len Wein and Dave Cockrum were given the job of coming up with a new team that was far more diverse and international. Fans got a German (Nightcrawler), a Russian (Colossus), a Canadian (Wolverine) and a Native American. In writing stories, they soon learned that they had a problem. To quote Cockrum: “We created Thunderbird as an obnoxious loudmouth, and we already had an obnoxious loudmouth in Wolverine. So one of us decided to kill him off.” Which is why we X-Men newbies (Mark, me, Micahel Edens) decided to use Thunderbird as the character we were going to kill off in our opening story (we were trying to stay true to the spirit of the books). Atop our todo list during the first week was: “Kill off Thunderbird.” Well, somebody somewhere noticed that the only X-Man that we were planning to kill was Native American. Sorry: we don’t care if they killed him in the comics, we can’t do it on Saturday morning TV. Fine. So I dug around and found another character who had died, sacrificing himself for the X-Men: Changeling. Only we couldn’t use the name (long story). So the lone sacrificial X-Man became “Morph.” The rest is history. By the way, to show you how much Thunderbird was in everyone’s mind early on, take a look at an image from the opening credits, on the “opponents” side. There is John Proudstar, next to Juggernaut, angry as ever. Last night on a podcast, some nice folks from upstate New York asked us all sorts of questions about X-MEN:TAS. I had answers to most of them, but one eluded me. “Is there an X-Man you hope to see in a solo film one day?” After serious thought, I responded: “No. I always think of them together.” That’s weird, but it’s true. I can enjoy The Avengers in individual movies — Iron Man, Thor, Hulk, Captain America, etc. — because their stories started with them as individuals. Joss Whedon’s masterful job in the first movie at getting them to work together for a few hours was just that — an effort. They aren’t a natural team (which is half of the fun watching them try to be). They aren’t a family. Does Thor care how Tony Stark’s day is going? The X-Men came into being as a group. They live and work together. In looking back at the team we chose, I believe that losing just a couple of them could have really hurt the stories. I know and enjoy them in relation to each other. I believe that’s why they have lasted, off and on, for over 50 years. So even though I look forward to the “Logan” movie (great trailer), half of the pleasure in that movie will be seeing him interact with Charles Xavier. They have 35 years of books and 76 episodes-plus of TV history together. They “grew up” toegether. That’s why I didn’t have an answer for Tom & Kimber’s podcast. I just don’t think of the X-Men apart — which to me means they have achieved something special. Hank McCoy is the most thoughtful superhero character I know, anywhere. He didn’t start out that way. In the first dozen books in 1963, he’s just one of the the guys, a big lug who wisecracks and leers right along with the other regular-guy, street kids taken in by Dr. Charles Xavier. Then, to someone’s credit (Stan’s?) Hank McCoy started sounding distinctly more well-read. Not wise or thoughtful yet, but he started to conspicuously use “big words,” a fancier vocabulary that set him apart. The idea evidently was to contrast the fact that he was “the Beast,” erudite despite his appearance. When years later he gained acutal fur the contrast increased, and as he and the other X-Men became accomplished adults rather than mouthy teens his wisdom and eloquence gradually increased. 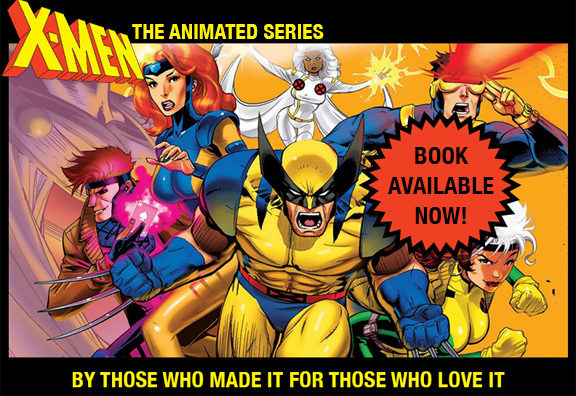 We at X-MEN:TAS ran with this idea, supercharged it. Our constant method was to differentiate our characters as much as we could, so we wrote Hank to be as thoughtful and considerate as we could make him. Wolverine cared deeply about people but, in true rebel-hero fashion, he’d be damned if he’d show it. Our Beast was so confident, so at home in his own blue skin, that he openly displayed his kindness and compassion with no fear of diminishment or ridicule. He was big, strong — and kind. He loved to read, as did we on the X-MEN:TAS writing staff. Below is an image of Beast, at the end of “The Phoenix Saga” when the team has just realized that Jean Grey has decided to sacrifice her life. Moments later he manages to conjure one of his most heartfelt poetic quotes, from Emily Dickinson: “Parting is all we know of heaven and all we need of hell.” Thank you Hank, and flawless voice-actor George Buza, for giving us that moment.